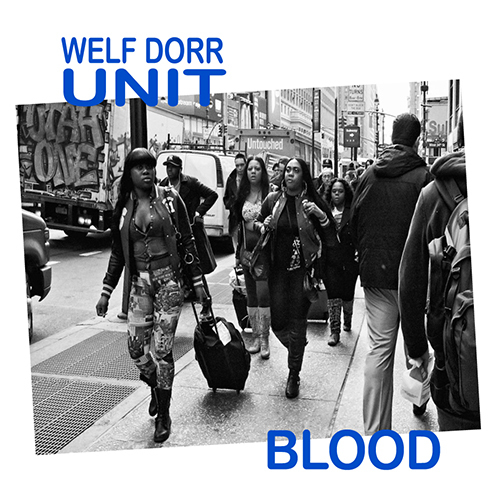 The Welf Dorr Unit (WDU) combines free jazz spontaneity with the urgency of funk and rock. The fiery quartet takes inspiration from the motto “Jazz is the Teacher, Funk is the Preacher,” taken from the title of a song by James ‘Blood’ Ulmer (who also inspired the WDU’s album title). WDU features Welf Dorr on alto sax and bass clarinet, Dave Ross on guitar, Dmitry Ishenko on bass and Joe Hertenstein on drums. The quartet was originally formed in 2012 for a performance at the Evolving Music Series curated by Arts for Art, presenters of the renowned Vision Festival in NYC. Dorr’s other main project is Underground Horns, a 6-piece brass band called “an unapologetic party band with brains…with tonal inflections from the Big Easy, central Africa, the Maghreb and the Baltic states” by the New York Jazz Record. Dorr has performed at venues and festivals throughout the world (including concerts in Egypt, Tudo é Jazz in Brazil, Willisau in Switzerland and Jazz at Lincoln Center) and has shared the stage with musicians including Rebirth Brass Band, Big Sam’s Funky Nation and B.B. King. Besides leading his own projects, Dorr is a member of Karl Berger’s Improvisers Orchestra, Kenny Wollesen’s Himalayas, On Ka’a Davis and the Famous Original Djuke Players and the Nublu Orchestra conducted by the late Butch Morris. He has also played and recorded with Frank Lacy, Sonny Simmons, Sabir Mateen, Kim Clark, Ronnie Drayton, Graham Haynes, Meshell Ndegeocello, Jeffrey Shurdut, Daniel Carter, Steve Swell, Lukas Ligeti, Vernon Reid, Juini Booth, Jojo Kuo and the Goldsparkle Brass Band.